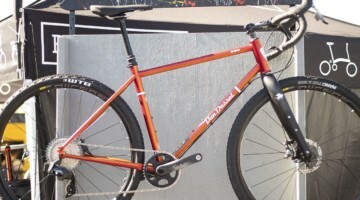 We’ve got gravel tires, gravel bikes, gravel wheels and even gravel garments. Why not gravel shoes? 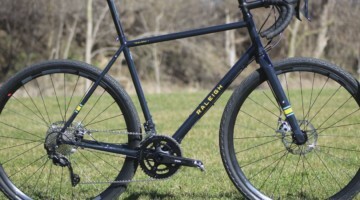 While we’ve tested mountain bike shoes with minimal Michelin tread that we’ve found better suited for gravel than mountain biking or cyclocross, Shimano has spent some time at the Almanzo 100 for several years testing out gravel-specific products. 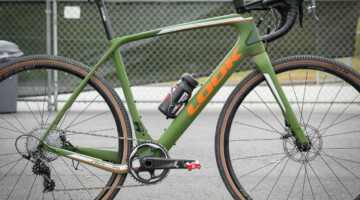 This year, it was the RX-800 and RX-805 rear derailleurs, but before that, it was to test and develop the XC5 gravel-oriented shoe. 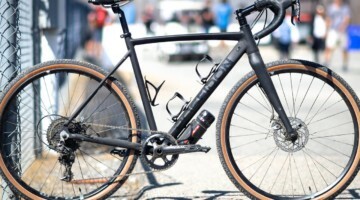 We can hear some eyes rolling after reading the term “gravel shoes,” and we certainly can understand cynical readers thinking it’s just marketing. 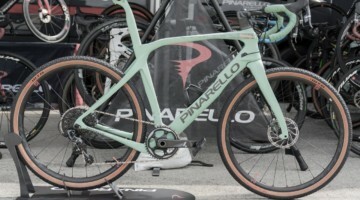 After all, when looking at bikes, a gravel model might be a more burly version of a road product or a slimmed down mountain bike product. 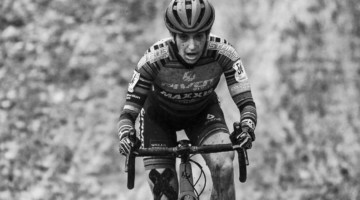 Add in the fact that we see plenty of gravel race winners riding road shoes and pedals and little running or hike-a-bike in gravel racing (with the exception of an occasional river crossing or a trudge through a rare deluge), and the broad selection of road, mountain bike and cyclocross shoes should offer the slipper that fits any gravel race in the kingdom. 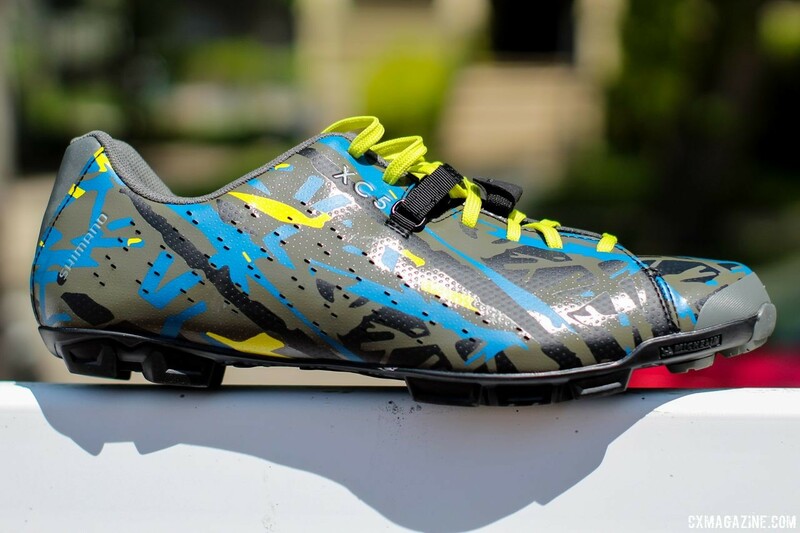 Our team received a pair of Shimano XC5 shoes shortly before last cyclocross season and another special-edition blue and yellow camouflage pair before the Almanzo 100 gravel race in May. Find out if the XC5 shoes are the right fit for your next day of gravel adventure, creek crossings and the occasional hike-a-bike. What makes the Shimano XC5 a gravel shoe? 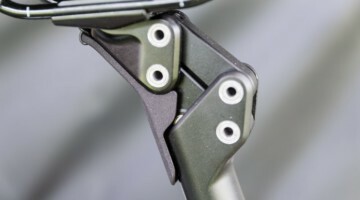 Shimano boasts its lace system offers the ultimate fit and adjustability for long days on the bike. The company’s “Mini Power Strap” breaks the laces into two different sections, allowing the rider to lock in independent tension adjustment near the toes and ankles. The Michelin-rubber sole is less aggressive than your typical mountain bike shoe but fully armored to protect the carbon fiber-reinforced midsole against sharp Kansas flint and Sierra stones. Shimano rates shoe stiffness on a 1-12 scale, and the XC5 checks in at a 7, which is toward the flexible end compared to both its road (min. 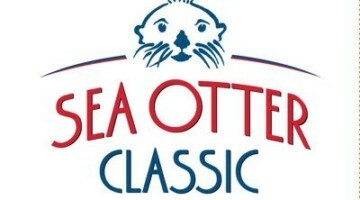 6) and off-road (min. 5) shoes. The XC5 shoes come in black with magenta laces for women and either black or gray with orange laces for men. Shimano also recently released a special edition of the shoe with a yellow and blue camouflage scheme, although the number of pairs available is pretty low. 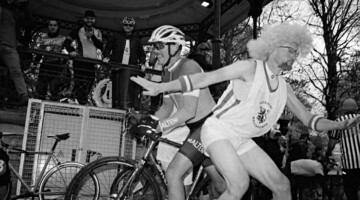 Find yourself finishing in the dark? Shimano added a reflective heel for added visibility. Weight-wise, our size 45 test shoes checked in at 681g for the pair. 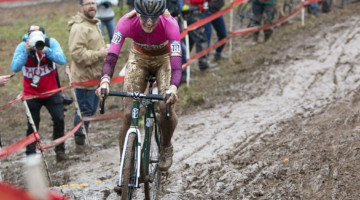 When we get a new pair of kicks just before cyclocross season you can be sure we’ll test them not just for gravel but also in the mud and ruts. 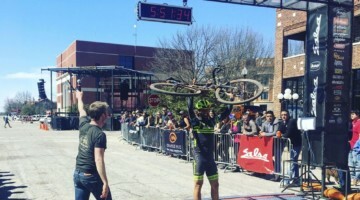 In fact, we spent half of the cyclocross season in them, and rode with them at Almanzo, Lost and Found and on our fair share of singletrack. First, regarding fit, the lace system is accommodating of a diversity of foot shapes. Most high arches, flat feet and narrow, low-volume and wide feet should find a home in the XC5. Both our testers have narrow feet, and with the laces pulled almost completely tight, they found a comfy home in the shoes. 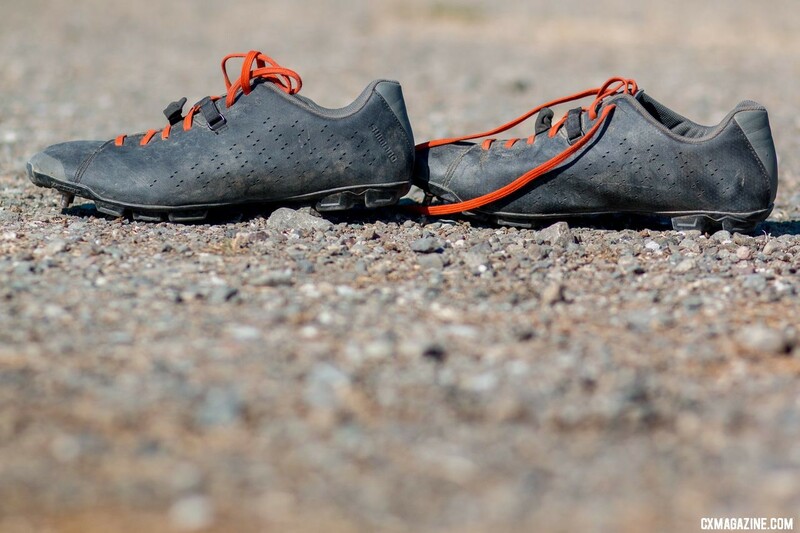 We’ve been pleasantly surprised how laces have been problem-free during all types of riding and racing, with the Giro Empire VR90, ridden by a number of cyclocross pros, securing the comeback of laced shoes in 2014. 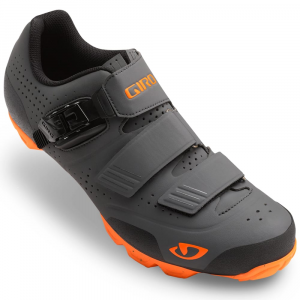 Perhaps it’s no coincidence Shimano’s offering has copied the black with orange laces that Giro offers. If you’re used to a stiff, full carbon soled mountain bike shoe, you’ll notice that the XC5 is not the stiffest shoe on the block. There’s notable flex near the toes, and under hard efforts and small pedal platforms, you can feel the give in the sole. Our experience reflects the 7 out of 12 stiffness score Shimano gives the XC5 shoes. Whether or not that’s a great thing likely depends on your gravel ambitions. 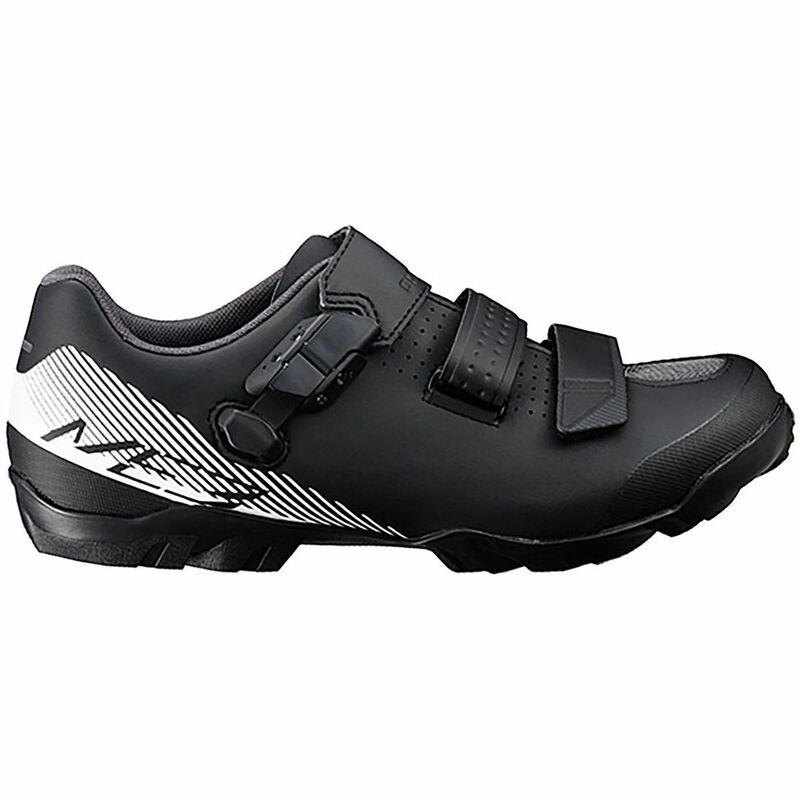 Looking for the most efficient shoe to power your aero-bar-equipped-rig to gravel glory? You’ll probably prefer an aero carbon-soled road shoe over the XC5. 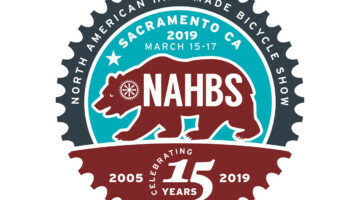 Out for a long day, with multiple strolls through the aid stations, or have some hike-a-bike in your backpacking future? The XC5 may offer a comfy option. 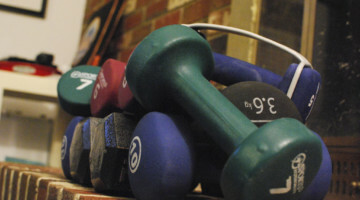 After six months of use, one test pair’s uppers have certainly softened up. 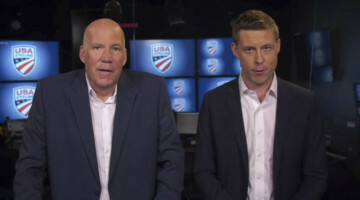 It’s more comfortable than ever but doesn’t quite offer the support as it did on day one. Gravel Only or ’Cross Worthy? 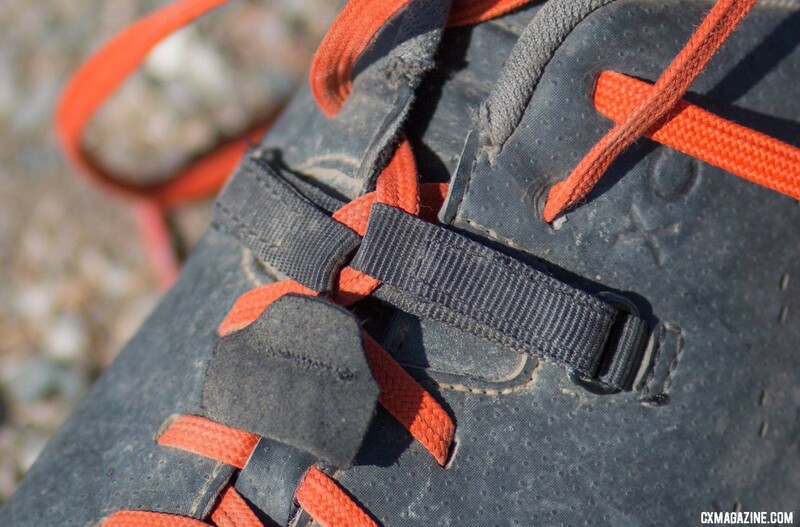 Since gravel is a versatile discipline, it makes sense that the XC5 shoes might have crossover appeal for other uses. 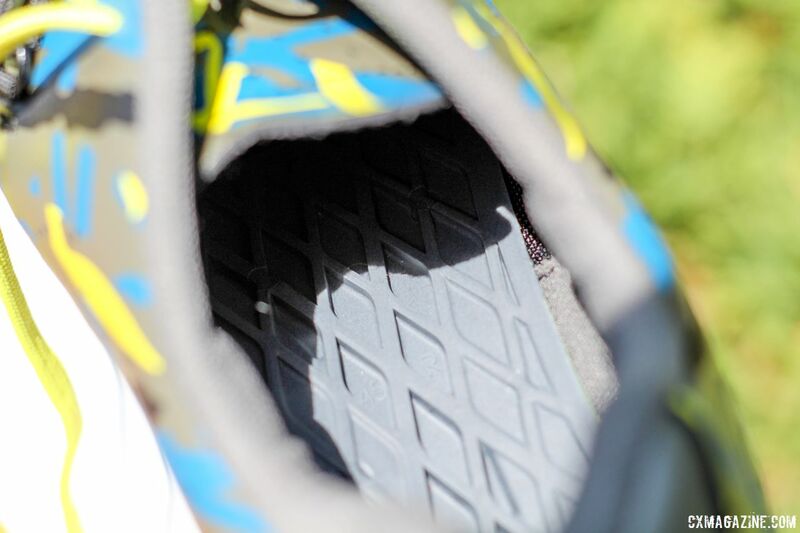 If you struggle in your stiff, carbon soles with steep run-ups, the XC5 is an awesome run-up shoe. 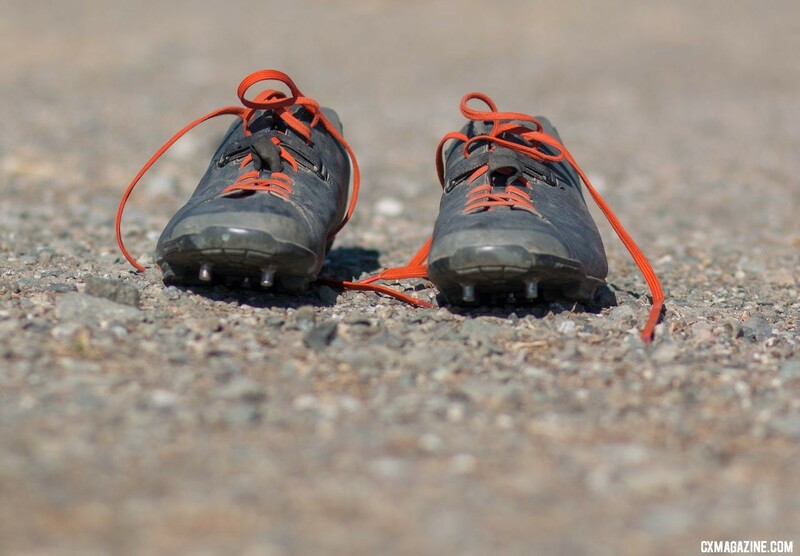 Add in some toe spikes, dig in and run past your competition. Sure, your laces will never look the same after a muddy day, but the flex helps get scale the steepest hills, even if the Michelin sole’s minimal lugs do not. Commuters also might find the XC5 to be an ideal shoe. The sole is durable and offers easy walking, while the laces (the grey ones) offer a stealth look around the office and café. The reflective heel should warn drivers to give you room after a late day at the office. 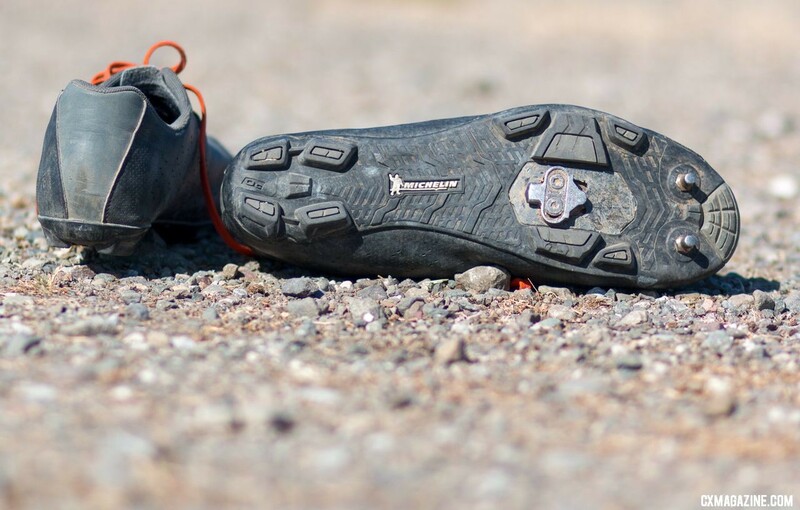 With the gravel continuing to grow in popularity, it is not really that surprising to see gravel shoes starting to come on the market. 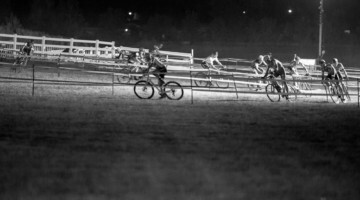 The challenge for companies is that no two gravel events are the same. 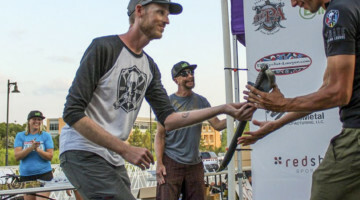 Some are fast speed-fests that are not too far from road races, while others feature hike-a-bike sections, creek crossings and other sections that force riders to their feet. With the XC5, Shimano designed a shoe geared toward more gravel riding that features a good amount of time off the bike. The shoe’s relatively soft sole makes walking and even run-ups comfortable, but it does not provide a stiff platform for putting down the watts. At the same time, with a mountain-style sole, the XC5 could also pull double duty as a cyclocross shoe, and the low-profile design and built-in reflective panels make it commuter-friendly as well. 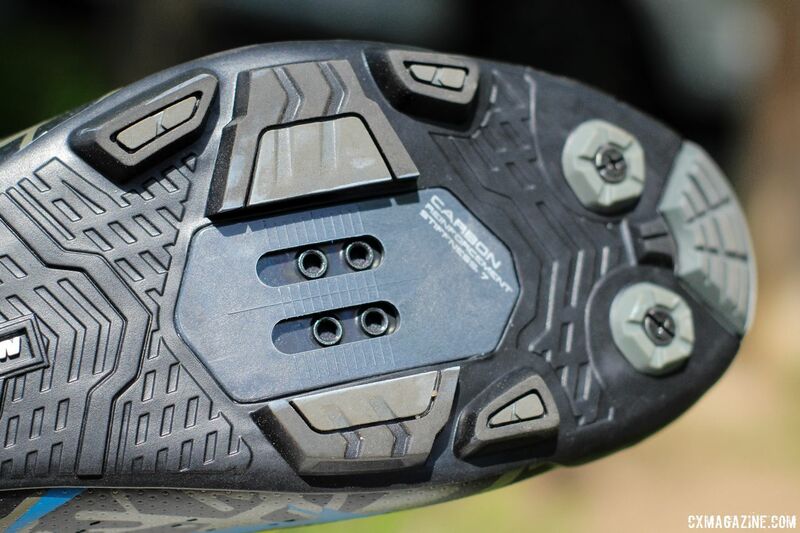 As we saw when we attended the Almanzo 100 this year, Shimano has made a strong commitment to gravel as a company, and the XC5 shoe is one product of its design and testing. 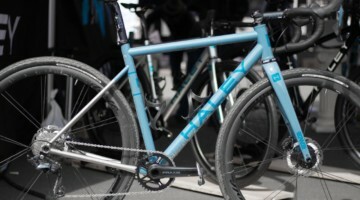 It is one of the first gravel shoes we have seen, but it almost certainly will not be the last. We will be keeping our eyes out to see how Shimano and others approach making a gravel shoe given the discipline’s many and broad definitions. 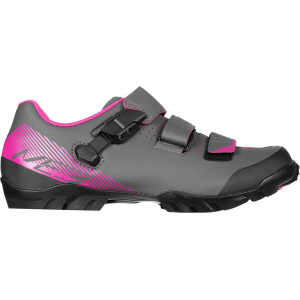 These shoes won’t work with wide-ish feet, but sadly that’s the case with most cycling shoes. My pinkies get a bit crushed in them, and no matter how loose I tie the laces at the bottom my toes start to cramp after 20-30 minutes. A shame because otherwise these shoes would be perfect. Sorry to hear that. They have been perfect for me.